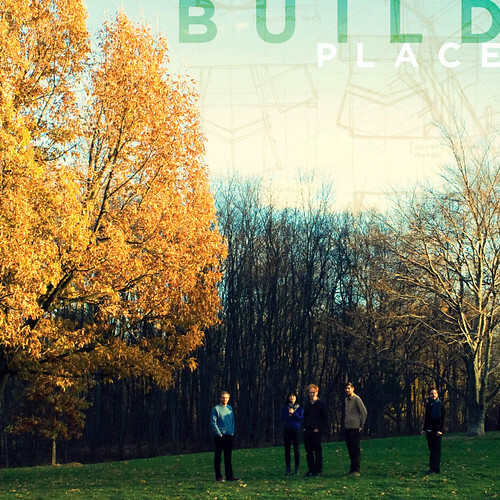 Build’s second album, Place is a nine-track, hour-long LP. It has an expanded musical range from our 2008 self-titled debut that includes not just pieces for our standard set-up of violin, cello, piano, bass and drums, but also a 3-part trio for cello, piano and drums (Swelter); and a quintet (Anchor) that uses extensive arco (bowed) bass, and vibraphone and concert bass drum instead of a drum set. Where Build recorded on a $1000 budget with just over two days total for tracking and mixing, Place was recorded with five days each for tracking and mixing allowing for a richer, more sophisticated production and an expanded sonic palate. Also, the band’s sound has matured considerably since Build. Where Build was recorded within the first year of our being a band, by the recording of Place, we had been playing together for about 3½ years and have a more developed and cohesive sound. I thought of the first album as having a quite a big range of styles, but this one goes even further. While many of the tracks are wildly different from one another they all connected to each other. I hope that after multiple listens the interrelation of the tracks and an overall journey/narrative/arc of the album will emerge for listeners. The album opens with Behavior Patterns for the standard Build set-up, but with all the strings playing pizz (plucking). This creates a transparent texture in which grooving patterns are layered to create counterpoint and composite melodies between the different instruments (in the first and last parts of the piece the violin and cello each play 1½ melodies with the two halves combining together to create a third). The drum pattern for Behavior Patterns has constant eight notes in the drums that mimic and mesh with the pizzicato string and propel the piece forward. The hi-hat is locked in unison rhythm with the piano chords throughout the entire piece. The title for Dissolve is to be taken literally. The piece moves from alternating repeated dissonant chords and rock sections to pulsing, expansive chords that sound almost orchestral. This is a piece that my high school self would love: some of the licks in the rock sections are straight out of my years spent in the all-ages punk scene in San Diego and the ending pulsing section is reminiscent of the John Adams music I started listening to and fell in love with around the same time. This piece is a fun, fast trip to take with the band, changing energy dramatically over its four minutes. The end result is kind of in the tradition of Sonic Youth (and more recently, No Age) moving over the course of a song from punkish energy to expansive noise. Ride is also to be taken literally. In the winter of 2009-10, I was doing a (fantastic) residency at Montalvo Arts Center in Saratoga, CA, working on writing music for this album. In the middle of January, I came back to Brooklyn for a weekend of remarkably mild weather. On the last day my girlfriend (at the time) and I went for a bike ride into Manhattan. When I got back to Montalvo the next day, I sat down at my piano and drum set and more or less wrote the piece in one sitting. The second chapter of the album is the three tracks of Swelter. Swelter is a 3-movement trio for cello, piano and drums. I wrote this piece during my first summer in New York. Growing up in Southern California and living there for all of my adult life up to that point, I had never experienced living in the oppressive heat and (especially) humidity of East Coast summers. In my tiny air condition-less 5th floor walk-up on Lower East Side, I was overwhelmed by the heat while trying to write this piece. The first movement is in a burning, claustrophobic 7/8 meter with phrases that expand and contract giving the feeling of tightening space. The second movement is a dreamy 4/4 that is a giving in- no more fighting the weather just submitting to the heat. I have grown to like how the heat and humidity during a heat wave I can never quite sleep through a night and my days have a dreaminess. Also, I think of the second movement as being related to Claude Debussy’s piano prelude, “Les sons et les parfums tournent dans l’air” (Book 1, #4) and to 90’s Portishead. The relationship to the Debussy is in the piano part: the low bass notes followed by melodic high chords that occur several in Swelter 2 are similar to the opening of the Debussy, and the planing middle-range chords in Swelter 2 are also related to similar chords in the Debussy. The relationship to Portishead is kind of a feel and sound-world thing. I always loved the sensuousness of sound in PH records, and I was going for that effect they create by processing via acoustic means (which are enhanced by the recording technique). Also the beat (when it comes in) is vaguely “trip-hop”-y although it comes and goes in a way it wouldn’t do in PH. The third movement is an arid 5/4. It was written when I was back in San Diego and to me it is the feeling of flying into San Diego and seeing the Anza-Borrego desert then the arid mountains then the brown chaparral-covered hillsides passing underneath before landing. Swelter 3 is also related to Drivin’ off the first Build album, which was written as an homage to Steve Reich. Both Swelter 1 and 3 use process-based compositional techniques and additive rhythmic, melodic and harmonic devices that are inspired by Reich. I like that the cello part at the beginning of 1 sounds a bit metal- not really very Reich. For the recording of the three movements of Swelter, Adam made substantial changes to his drum set (swapping out cymbals and snares, etc) that help each movement have it’s own specific sound. I feel like in the colors of each movement you can feel their relative humidity levels. Also, I love the muted, tactile sound of Swelter 2 that comes from the drums and the micing of the piano. The close mics on the piano felts bring them alive as another percussion element. The third chapter of the album (Cleave, Anchor and Maintain) is related to changes in my personal life that happened while I was writing music for this record. Cleave has four distinct layers. In order of appearance, they are: string glissandos, piano chords, an additive drum pattern and a piano melody (with bass accompaniment). The form of the piece largely just follows the drum part as it builds up a one-measure-long drum pattern one note at a time to its final 43-note pattern followed by a piano melody at the end. One of the early inspirations for this piece was Radiohead’s Videotape where the drum pattern does an almost additive thing that reminded me of Steve Reich’s Drumming for a minute. When I heard it, I wished they had gone all the way and gone strictly additive. For the recording, we double-tracked the string glissandos and I love the huge sound and then its devastating release before the piano melody towards the end. Anchor is one in a series of pieces of mine with a certain approach to form and musical materials that includes Imagining Winter (off the first Build album), and Swelter 2 amongst others. What these pieces have in common is a kind of dream-like treatment of the materials where they fade in and out of the listeners’ consciousness, are recalled in manipulated forms at different parts of the piece like a memory, are made vaguely surreal through different types of layering, and are arranged in an overall form that lacks a strong sense of directionality or clear narrative. Lots of the sonic ideas I’ve had for these pieces have come from my odd interpretations of record production techniques. From hearing an evocative use of a filter or manipulation of a sample, I thought of ways to create a similar effect with acoustic instruments in live performance through unusual techniques, voicings, or combinations of instruments. For the recording we heightened the acoustic effects slightly to make them work better on record, but not to the point where they sound artificial. Although it is hard to describe exactly what a piece is about as there is not really a one-to-one correlation to words, Anchor is in lots of ways a response to major unsettling changes in my life in the year before I wrote it. I thought of the title as corresponding to the special role of the bass drum. Maintain finishes the album with what I think of as a cross between a meditation, a warm embrace and an ecstatic release. Power chords are a lot harder to play on violin and cello than guitar.